Woodstock has been an artists’ colony since 1902. It is located in the Hudson Valley in the foothills of the Catskills below Overlook Mountain. The July 31st concert will be in the Maverick Concert Hall, home to the oldest summer music festival in the US. 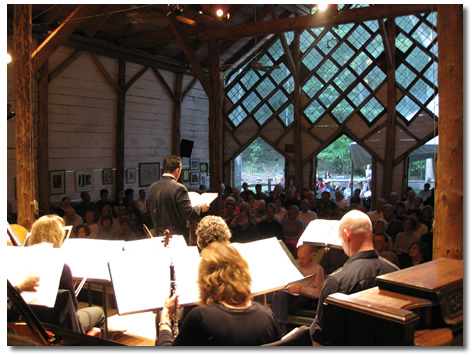 In it’s woodland setting, the Maverick is a beautiful hand-constructed barn with a 30 foot timbered roof, unusual angled windows and a spacious stage that wraps the performers in wonderfully warm acoustics. It has an extraordinary history that dates from the early 1900s. This concert begins at 8:00 in the evening and is part of the 19th annual Woodstock Beat. It will be a benefit concert for the Woodstock Byrdcliffe Guild. For tickets, contact the Woodstock Guild at 845-679-2079 or click here. Sponsored by Woodstock Chimes Fund. Address: 120 Maverick Road, Woodstock, NY.